Lined with trees, flowers and other indigenous plants, the Buenos Aires Botanical Gardens are a great place to take the kids. 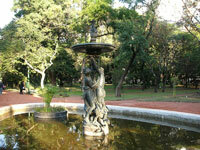 The garden has been open since 1898 and was designed by Carlos Thays in a triangular shape. There are three different styles of gardening contained in the gardens - a symmetric Roman garden, a picturesque Oriental garden and a mixed French garden. With plenty of open space for kids to run around, its the ideal location to relax with a picnic or take a leisurely walk with the family. The central greenhouse is also great to explore for the more inquisitive children. In more recent years, the garden has become home to hundreds of abandoned domestic cats. It's estimated that approximately one cat is abandoned in the gardens per day during the summer, so instead of fighting a losing battle trying to remove the cats, a volunteer society was established to feed and care for the cats and put them up for adoption. Visitors to the gardens can rest assured the garden's cats are clean, tame and well-fed. Aside from cats, the garden is filled with thirty-three artistic works such as sculptures and monuments, and there is a Botanical Library that is open to the public.